Rosso Corsa ha un nuovo punto vendita presso Retro' Vintage Lifestyle & Motors. 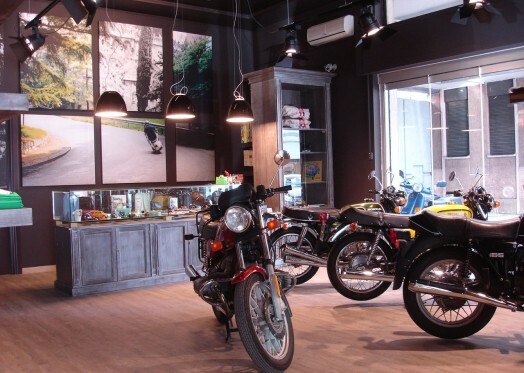 Retro' Vintage Lifestyle & Motors nasce con l'obbiettivo di creare un ambiente di riferimento per tutti gli amanti dei motori di una volta. Presso Retrò Potrete trovare caschi, capispalla, guanti, accessori vari, ricambi, delle marche più prestigiose. E' possibile inoltre ottenere consulenze su compra/vendita moto e auto anni ’60 – ’70 – ’80 – ‘90. My spouse and i ended up being alslbuteoy cheerful when Edward managed to round up his basic research using the ideas he was given while using the web page. It is now and again perplexing to just continually be giving for free tips and tricks many others could have been trying to sell. Therefore we realize we've got the website owner to be grateful to for this. Most of the illustrations you have made, the easy blog navigation, the friendships you will make it possible to instill it's many superb, and it's really making our son and us know that this theme is amusing, and that is rather pressing. Thank you for everything!